Life without Mexican food is no life at all. I grew up with that sentiment posted on the refrigerator, and it’s become my mantra. A future without Mexican food is pretty dismal. Since tortillas, both corn and flour, are staples in Mexican cooking, then, it stands to reason that it’s a vital skill to learn, and since we already have plenty of beans stored, we’re more than halfway ready to serve up a tasty, hot Mexican combo platter! Tortillas are also a heck of a lot easier to cook than bread. There. I said it! I have to plan my day around baking bread, but with less than a half dozen ingredients, hot homemade tortillas can be ready to eat long before that bread dough is on its second rise! Now, I’m hardly a master tortilla maker. Sometimes my tortillas are too thin, sometimes too thick, but practice makes perfect, and that’s what our Skill of the Month is all about! To get started, reader Emily S. sent me a link to a really terrific food blog, What Megan’s Making, and a recipe for tortillas that Emily really likes. Here’s a recipe that Suzie Brown, manager of the Honeyville Farms store in Salt Lake City, shared with me. She uses shortening, which, as you know, has a very impressive shelf life. Combine all ingredients together. Mix till smooth. Form a small ball of dough, approximately 2″ across, and roll into a circle using a rolling pin. As each tortilla is finished, you can either cook it in on a dry griddle or in a frying pan with some oil. With tortillas, you can make tacos, burritos, tostadas, tortilla chips, quesadillas, wraps, and those crunchy little tortilla strips that restaurants put on top of salads to make them look fancy! I’ve even seen tortillas covered with Nutella! Tortillas are quick, versatile, and delicious. I think you’ll thank me later for making you learn this skill! And, be watching for a tortilla-related giveaway later this week! My kids love these….okay, we grown ups love them too! I also use a similar recipe that calls for yeast…it makes a chewier version that doesn't dry out so quickly and is delish with grilled meats and veggies. They keep well in the fridge and take only a few seconds in the microwave to reheat. I omit the potato flour and use additional white flour. I've also made these half white/half wheat and they're delicious. Rolling them out between 2 sheets of wax paper makes things much simpler. This is awesome! My hubby sent me a text this morning to pick up tortillas for dinner. I joked back, “we’ve got plenty of wheat, get to grinding.” I then checked out Survival Mom and lo and behold, that’s the skill of the month. You’re reading my mind! I’ll admit, I went to the store during lunch and picked up a pack of tortillas, but I will definitely learn this skill. I made homemade tortillas, for the first time in my life…last week! I told my husband I was going to try and work on some skills this summer. This one is easy enough to not stress me out, thanks for sharing! awesome. It's impossible to find gluten free tortiallas. Even corn one's have some wheat in them. I think i'll try to make some myself. You can get the Mission White Corn tortillas. MY SIL can not eat gluten and that is what she uses. A good health food store will have gluten-free tortillas. I've been wanting to learn this, so thank you for sharing! I'm anxious to give it a try now. My friend and I want to try making our own tortillas. Looks like we will have to give it a try. My friend uses vegetable oil instead of shortening and the tortillas are wonderful. I'm not sure of the proportions of oil / flour – she just eyeballs it. Does it need to be Masa flour for this? I have at least 20 lbs of that (specifically to make tortillas) in mylar bags with O2 absorbers in the basement. Gotta love a good sale! Corn masa flour for tortillas is what you need for the corn ones. White, or some combination of wheat flour is what you need for the others. Whatever you prefer for American-style bread will do for tortillas, too. Yes, you may have potato flour, whole wheat, multigrain, even bean flour tortillas if you wish. Play around till you find what works for you. This was on my list of skills to learn this year! Guess I am doing it in May! On a related note to your blog post – I would HIGHLY suggest you try the Artisan Bread in 5 minutes a Day – it really works and the 5 minutes is no lie either. It is quick and yummy! Share, please. What is the recipe? Thanks! ABSOLYTELY second that!!! Amazing bread with very little effort and would be great after the poo hits the fan! I use my nonstick pancake/waffle baker. I press the tortillas and stack them between waxed paper. Heat the girddle. Put the first tortilla on and peel away the waxed paper (peels easily when slightly warmed and you can reuse it). After 1 minute, flip the tortilla to the other side of the griddle and put on the next raw tortilla. 1 minute on each side cooks them and they are SO MUCH better than store tortillas. This is one food that is best made fresh. 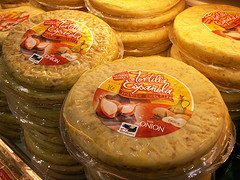 Most of the Mexican stores sell fresh cornmeal tortilla dough, made up every morning. The Mexican Mamas who make their own corn tortillas most often do not make their own dough if there's a Carnicaria near that sells it. Beginners may want to take this little hint, and buy the dough the first few times before they try making their own from nitty-gritty scratch. A friend from Mexico told me one of the tricks to making great tortillas is to make sure the water is as hot as you can stand and still be able to knead the dough. It made making them so much easier! I found a recipe for Naan Bread. It's made with yeast and is puffier than a tortilla, but is not baked. I'm thinking of anything I can make without an oven. Just in case. My tortillas are not so good, but it takes practice. I started making my own four tortillas when I ran out of store purchased one day. The kids and I loved them. DH never tries anything new. I think he will starve if he has to live through a serious emergency situation. Don't feel bad my DH is the same way. I want to thank all the survival Mom's here and elsewhere for all the great ideas they share with all of us. May not respond alot here yet know I am reading each post as ya'll are a wealth of information for me and mine. Hope your Mothers Day makes ya grin !! Goal accomplished. Just made a batch (about 18) homemade corn tortillas. They're still warm and will make a wonderful addition to Mothers' Day breakfast. I made these at lunch today. The dough seemed really wet but the tortillas turned out well. I just put the ball of dough between a piece of parchment paper and pressed it down. Then did the dry fry thing. Good recipe. Oh, I also used hot water. A 1/2 cup of shortening sounds like a awful lot for 2 1/2 cups of flour. Is that correct? I also tried homemade potato chips today. Some experimenting will be necessary to get them right, but that just means more chips to eat! For what it's worth you can use pan fried bread (like a Navajo pan fried bread) in place of tortillas. Usually the major difference is you don't fold it like in a taco or roll it like with a burrito. You build it like an open face sandwich. Still very "Mexican" or Southwest Indian flavor but more filling and interesting. I used to live near the Navajo reservation and learned how to make authentic fry bread, along with all the patting back and forth between my hands. I tried the recipe again recently, and I\’ve completely lost my technique! It\’s an easy option to tortillas, though. Thanks for the suggestion. We've always loved tortillas – until we spent a few months in the SW US, at that point we officially became addicted to fresh ones 🙂 Then I had to figure out how to do them myself LOL Its not just "Mexican" food – you can use them as the bread for hot dogs, chicken, various salads, ect. And dont forget desserts – family fav is melted butter, sprinkled with cinnamon and sugar, yum!! flour tortilla dough when deep fried will puff up to make sopapillas. drip on honey or cinnamon sugar. I think an Indian version is to use some wheat flour. Then after rolling out, fold in half and roll out. Then fold and roll again like a triangle. When you cook on the griddle with some light oil, it puffs like a pita. Pretty neat trick. I tried it once after seeing it done on TV to get the rolling and folding idea. I have a survival food recipe book I put together, lamenated the pages and put into a 3 ring binder. Recipe #1, Tortillas! There are so much easier to make than bread. Yeast doesn't store for long and once it's gone, it's gone. Tortillas or any flat bread can sustain us for just as long as bread, the recipes are very versatile and we all know rice and beans are typically the first things people buy. Add some tortillas and you've got a great meal! Happy Prepping everybody! Take a very clean quart jar. Add 1 cup flour, 1 1/2 cups warm water & a teaspoon of sugar to it. Stir it up well, until it makes a sort of sloppy paste. I then place a square of cheesecloth across the opening and use the metal band to hold it down. Set outside in a spot out of direct sunlight if possible, you don’t want the paste to dry out.. If not, place inside in an out of the way spot. Keep an eye on it. In about 3-4 days you might notice bubbles forming around the top. This is good! Wild yeasties are feeding on the mix in the jar.. Stir it up a little, add some water if needed and let it set for another day or so until you see a bunch of bubbles. The paste will develop a pleasant sour smell to it. If it stinks (and you’ll know it) or if it develops a pinkish color, throw it out. Clean & sterilize the container and start again. It’s picked up some undesirable spores. The sourdough starter is now ready to use. To store, put on a loosely fitting lid and store in the ‘fridge. Every month or so, bring it out, feed it a mixture of equal parts flour & water. Let set on the counter to warm up and gather more yeast. Use it, or put it back in the fridge. Regarding the gallon bags, they are way to expensive for this purpose. Instead, use wax paper sheets. You can find wax paper in the aluminum foil section. I make my corn tortillas with Masa and use a saucer plate (back side) to flatten a 2″ ball of Masa placed between two sheets of wax paper. Then I remove the top sheet and finish off the edges and flattening process. Pressing down gently with fingers creates high and low spots that help cook the tortilla evenly. Flip when the top side starts to get slightly dry and press down with flat steel spatula. Most of the time, this pressing process will allow the tortilla to “puff up”, which is great for filling with cheese or meat filling….yummy! The Mexican women I know use a grocery bag. The same one just sits in their tortillera (tortilla press), sliced as the gallon bag was described. Even if you are using a rolling pin on the counter, a grocery bag works fine. No sense in paying for a gallon bag OR wax paper for such a task. You can also store Instant Masa to make corn tortillas. Any large market will have it in the flour aisle. They’re easy to make and the masa can be used for a lot of different dishes. Masa flour must have the processing to release the B vitamin that prevents pellagra? Just grinding corn into flour and cooking it up won’t do it and in the old days a diet with such unprocessed ground corn as the staple did result in pellagra. The traditional processing with wood ash or lime or something is what releases the B vitamin. I did the process of cooking whole corn kernels with wood ash once – it took forever, was messy and I never want to do it again unless I have to.